Federal authorities have released a final recovery plan for the Snake River's sockeye salmon runs, which teetered on the brink of extinction in the 1990s. Only a handful of sockeye returned to spawn in central Idaho's Redfish Lake during that decade. But through a hatchery program that worked to pass the wild salmon's genetic fitness on to their offspring, more than 1,500 adult sockeye made the 900-mile journey from the Pacific Ocean to Redfish Lake last year. The count was the highest going back nearly six decades. "I think this really does show the resiliency of the species," said Rosemary Furfey, the National Oceanic and Atmospheric Administration's salmon recovery coordinator for the Interior Columbia Basin. The recovery plan released Monday by NOAA aims to build on the success, creating a self-sustaining population of the endangered fish over the next 50 to 100 years, authorities said. Sockeye historically spawned in five lakes in the Sawtooth Mountains. But a century of grazing, water diversion for irrigation, dams and chemical treatments in the 1950s destroyed habitat and killed fish in the lakes. Overfishing in the early 1900s and years of poor ocean conditions also took a toll. Now, enough fish are returning that the 431-page plan includes recolonizing two more central Idaho lakes -- Alturas and Pettit. Years of work has made that possible, including removing fish barriers and buying ranches and water rights to keep enough water in streams for fish passage, state and federal officials said Monday. Improvements at the Lower Snake River Dams also improved survival rates for juvenile sockeye migrating to the ocean. "I'm amazed at how far we've come," said Tom Flagg, a scientist with the Northwest Fisheries Science Center who's been involved in the recovery program from the start. The goal is to eventually lift federal protections by having enough young fish survive the journey downstream, spend several years in the ocean, and then return upstream as adults to spawn naturally. The plan says the fish can be considered for delisting when the lakes have a yearly average of 2,500 fish returning from the Pacific Ocean over a 10-year span. Greg Stahl of Idaho Rivers United said he's pleased that the hard work by state and federal agencies has prevented an Idaho run from going extinct. But he said the plan falls short in not addressing problems caused for salmon by four dams on the Snake River. Idaho Rivers United has long advocated removing the four dams, and cites them as a major stumbling block for ever recovering sockeye salmon to the point where they won't rely on hatcheries. "We clearly have a few differences in how to continue moving forward from here," Stahl said. "We have to put pressure on those dams or we're not going to get there." 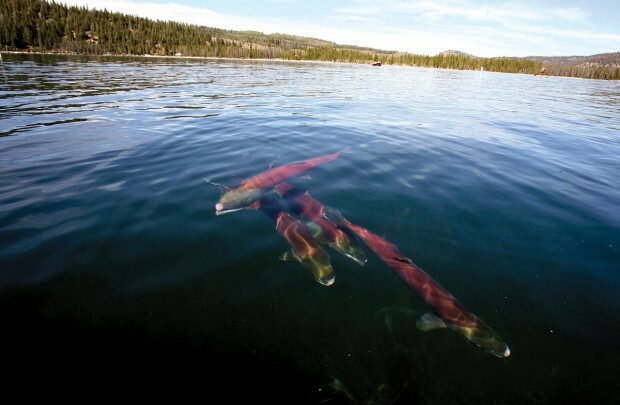 How will this new plan achieved recovery of Idaho's Sockeye? Please tell us. bluefish.org is offering a $5000 reward to anyone that can show how the federal plan will bring about the recovery of Idaho's wild Sockeye Salmon. See www.bluefish.org website home page for details.